Notes: Ex-CR, Exx-PC, Pan Am Railways "Boston & Maine Guilford Heritage Engine"
Description: Well, the next four years anyway. 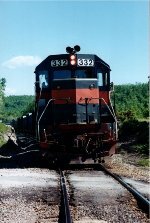 A Guilford repaint-actually, an ex D&H 7600 series GP 39 that Guilford "transferred" to the B&M, leads a northbound at Bainbridge. 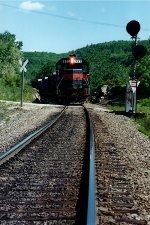 Note the railfan chase vehicle in the foreground. 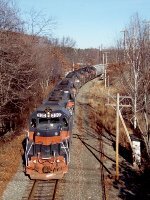 Description: A B&M GP40-2 leads this westbound train out of Conklin yard as seen from the Conklin Av overpass. 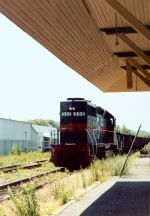 The trailing unit is notable, as it was one of the three ex Illinois Terminal SD 39's Guilford acquired from NS. Title: BM 332 at West BD, enroute to Hornell for work. Description: Just acquired from CR. Title: BM 690 at West BD, enroute to Hornell for work. Description: Easy to tell 690's last owner! Description: Another southbound off the D&H today, wish we'd gone north. Description: Winter and construction. Even the D&H is feeling the sting of construction work as PYRP heads for Belden tunnel, in a NY work zone. Description: PYRP pulls up to the north end of Bevier St yard, where it will get pushers for the trip over Belden Hill. The second unit is showing its heritage. Description: Rouses Point to Potomac Yard train RPPY rolls slowly through BD as it makes its wat into East Binghamton yard with 77 cars. It will be worked there, and sent south. Description: Within 3 months of this photo, Guilford would divest control of the D&H and Guilford operations in to PY would cease. Description: B&M 332, one of the last two phase I painted engines, leads RURJ (Rumford-Rotterdam Jct. NY) past a busy Deering Jct.